pet incinerator is a equipment for deal pet or animal cremation. family pet is people’s friend and we want to cremation our pet after they died. some pet cremation business supply ash for the pet owner. the pet incinerator function like other incinerator, but there are also some difference, some key point is door opening(we can feed the pet), oil or gas operation cost, moveable feeding door, smoke enviromental friendly, if we can collect ash, easy to use it, good service from pet incinerator manufacturer,etc. 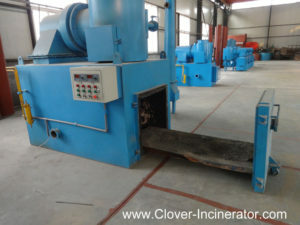 most of the pet incinerator is small size, the combustion chamber from 300liters to 900liters. we have model A360, A600 and A900 and also TS50 PLC, which is famous in market. good pet incinerator means burn the pet to be white ash, not black waste, see below picture from a dog cremation. Burning Rate *animal 20 kgs/Hr. 20 kgs/Hr. 30 kgs/Hr.